In this email: Sandvox 1.5.3 · Holiday Sandvox Savings · Blueball Quantum · Hosting Savings · "I Saw How"
Released just a few days ago, Sandvox 1.5.3 is a new version now available for downloading that includes important updates and fixes. Version 1.5.3 is compatible with the recently released version of the Sandvox Developers' Kit (1.5), so to take advantage of new plugins from Karelia and third parties you'll want to stay up to date. For complete details, read our release notes. Version 1.5.3 is a free update for all registered customers. All current and prospective third-party developers should be sure to download this version, too. Trimming holiday shopping budgets seems to be the rule rather than the exception this year, and with that in mind we're offering a 20% discount on purchases of both Regular and Pro Editions. 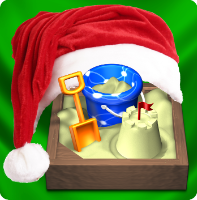 Whether you're a first-time customer buying for yourself or a current Sandvox user who would like to give Sandvox as a gift to family or friends, you can take advantage of our 20% discount through December 24th. Use the coupon code “SANTAVOX” when you visit our online store for holiday savings. We've had great feedback from Sandvox users who've based their sites on designs from Blueball Designs. Charlie Lockhart and his team are now offering several design packages at attractive prices, including the new Quantum design. Quantum features three color schemes and is available in two widths, giving Sandvox users additional flexibility. The Quantum design package also features automatic rescaling of any image above the content area to fit the page's content area, detailed Readme files with tips on maximizing design features, and six Photoshop CS3 Image Files you can use to create custom banner images. Six designs for $10... it's a hard offer to pass up! Be sure to visit Blueball Designs for more information about Quantum and other popular Sandvox design packages, including Smooth, Snapshot, Cubicle, and Pro Tabs. Live Oak Hosting, based in Austin, Texas, is a small, family-run ISP that offers personal service. Hosting plans range from $10-$45 per month with greater savings when paid annually, as well as custom packages. Live Oak promises satisfaction or they will pay your costs to switch to another host. Use the coupon code “sandvox” when you sign up to get a 10 percent discount. → Visit Live Oak Hosting. Server Logistics, based in Los Angeles, California, offers hosting in their secure 10,000 square foot carrier-class data center facility using rock-solid Apple Xserve technology. Prices range from $9.95/month to $69.95 per month with greater savings when paid annually. Server Logistics offers a 30 day money back guarantee. Use the coupon code “SANDVOX” for a 10 percent discount. A2 Hosting, based in Ann Arbor, Michigan, takes pride in its customer service, 99.99% uptime guarantee, and “green” business practices. Prices range from $4.95 to $7.95 a month for shared hosting, with dedicated, semi-dedicated, and virtual dedicated servers also available. A2 offers a 30 day money back guarantee. Use the coupon code “a2sandvox” for a 15% discount when signing up. From time to time we share sites created by Sandvox users that demonstrate certain features or suggest interesting solutions. In this newsletter we're delighted to direct your attention to Neil Boyd's site, I Saw How. Neil has been sharing his enthusiasm for Sandvox in exceptional ways, participating in our online forum and providing excellent feedback to our development team. For those of you who haven't had the benefit of Neil's advice, don't wait another day to visit I Saw How, his Sandvox solutions site filled with helpful tips, screencasts, and a growing bank of step-by-step instructions under the "HowTo" heading. Whether you're starting to experiment with the Code Injection feature of Sandvox Pro or are considering ways to extend the performance and capabilities of your Sandvox site, we encourage you to check in with Neil. With wishes for a happy and healthy holiday season.